Hurricane Hector was formed far out in the Pacific Ocean on 2 August with maximum sustained winds of 85 miles per hour (140 kph). Earlier this morning, Hurricane Hector was located 354 km south of Hilo, moving west at 25 km per hour, with maximum winds at its center at 185 km/hour. Hector is expected to pass within 100 to 150 miles south of the Big Island on Wednesday. A Category Four storm on the Saffir Simpson scale is capable of doing widespread major structural and infrastructure damage; it can easily tear off roofing, shatter windows, uproot palm trees and turn them into projectiles that can kill people. Forecasters expect little significant change in Hector's strength in the coming days. Nevertheless, an outer rain band and some gusty winds could make it to the southern edge of the island through Friday. Tropical storm conditions are expected across portions of the Big Island later today as the core of Hector passes to the south. 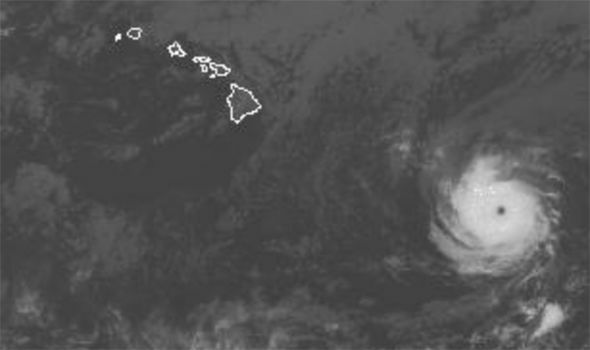 A Tropical Storm Watch has been issued for Hawaii County. Large surf is also expected along east facing shores of Maui. CPHC said "Swells generated by Hector will likely produce large and risky surf along southeast and east facing shores of the Big Island today".